[S1074] Sharon Sawaya, "Untitled," e-mail to Julia Langel, September 18, 2002, Untitled. [S1118] Swan Johnson cemetery marker, Gypsum Hill Cemetery, Salina, Saline Co, KS. [S2379] Nasum Parish (Kristianstad County Sweden), 1853-1861, Husforhorslangder (Household examination records), vol AI:7:176, unknown cd2. [S1117] Hattie O. Johnson cemetery marker, Gypsum Hill Cemetery, Salina, Saline Co, KS. 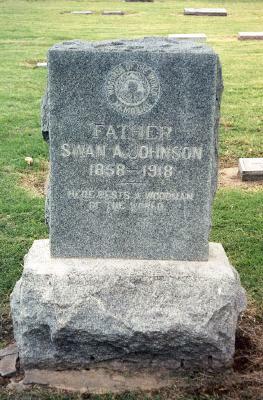 [S1079] City of Salina, Gypsum Hill Cemetery Database, online http://www.salina-ks.gov/content/126/168/950/217/…, Swan A. Johnson record. 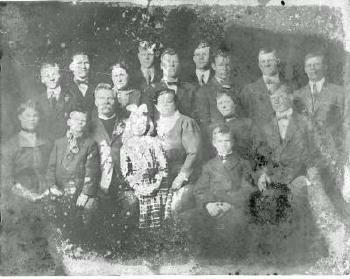 [S1811] Salina Journal, September 28, 1967, page 14. [S718] The Salina Journal, February 1987. [S1119] Theodore Johnson Cemetery Marker, Gypsum Hill Cemetery, Salina, Saline Co, KS.